In a joint pavilion of Polyram and Polyram USA –distributing Bondyram® products in North America, we were proud to promote the company’s new Bondyram® plant at Evansville Indiana. Products from the EP and Polytron® families were also presented. 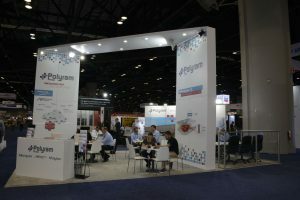 We had good attendance at our booth and feel that with the new factory, Polyram has a new and improved position in North America. The exhibition brings the entire plastic industry together, including global companies from the entire supply chain and the full range of end-user markets. The next show is due in May 2021 in Orlando, USA. During the exhibition, we were happy to meet with customers who see in the American factory an important opportunity for increasing their cooperation with us. Among those were existing customers but also new potential customers who until now could not benefit from Polyram products. In addition, coordinated meetings were held with suppliers of raw materials for the plant as well as meetings between key customers’ top management and Polyram’s Chairman, Mr. Ishay Davidi. Overall, we are thrilled to find that now with manufacturing in the US, a new market has opened for Polyram. This is the opportunity to thank Mr. Mark Richard from Maroon-Group,our partner in Polyram USA, for coordinating the meetings with the potential resin suppliers and our main Bondyram customers.